In a letter nationally coordinated today by the National Law Center on Homelessness and Poverty, the American Civil Liberties Union (ACLU) of Ohio is urging 69 Ohio municipalities to repeal their bans on panhandling. Since the 2015 Supreme Court decision in Reed v. Town of Gilbert determining panhandling is a right to free speech, every single case brought against panhandling ordinances — more than 25 to date — has been found unconstitutional. In February 2017, the ACLU of Ohio challenged Cleveland’s panhandling ordinance as an unconstitutional violation of the First Amendment. Ten months later the city repealed its ordinances and paid damages to the plaintiffs. Volunteer attorney with the ACLU Ohio, Joseph Mead tells Scene that anti-panhandling laws, and other laws criminalizing people experiencing homelessness, seek an easy answer rather than grapple with the complex issues that lead to homelessness. 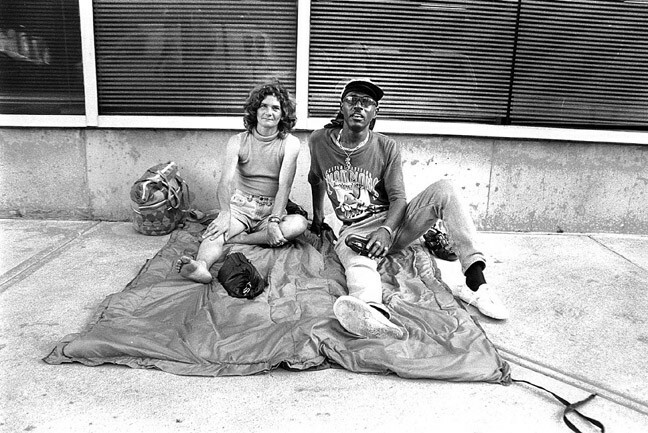 Mead says that as panhandlers and people experiencing homelessness lack political power, it is often all too easy for cities to restrict their rights — even their constitutional rights — to try to appease groups that are more politically popular. “The First Amendment means that cities cannot ban speech simply because people would rather not hear the message,' he says. 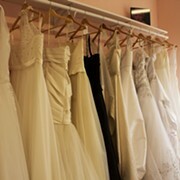 "Yet that is precisely what 69 Ohio ordinances do. They single out and punish panhandlers who ask for money." Mead stresses that banning panhandling is an example of the government deciding what people are and are not allowed to talk about. "Cities are also recognizing — and an abundance of recent research indicates — that criminalizing homelessness is expensive and simply doesn't work," Mead says. The National Law Center on Homelessness & Poverty provided a map showing the states with active panhandling bans (see above). Ohio is one of the worst states for panhandlers, and the NLCHP agrees that the enforcement of anti-panhandling ordinances is costly to the community, as it takes up police resources and slaps homeless people with fines and fees that they will be unable to pay, solving absolutely nothing. “We’ve seen this over and over again in Ohio," Mead says. "Whether it’s Akron, Youngstown, or Cleveland, cities try to criminalize poverty by ticketing individuals who are asking for help. 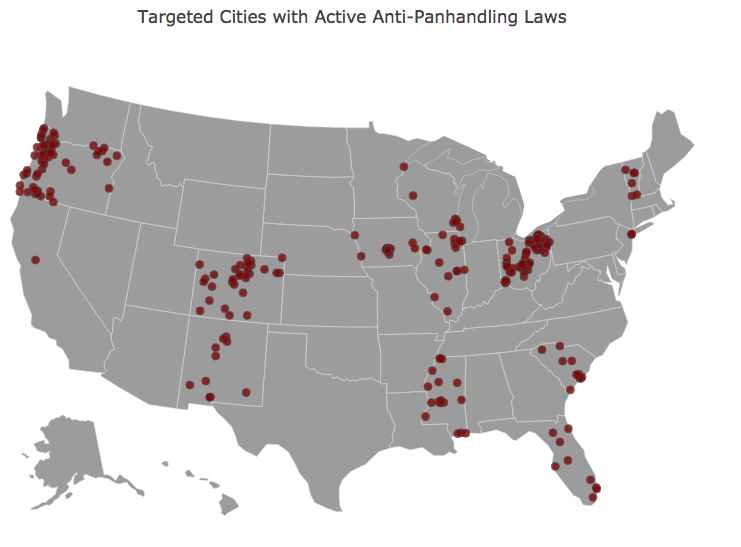 Not only are anti-panhandling ordinances unconstitutional, they’re bad public policy. These 69 cities must end these unconstitutional bans, which have been consistently struck down in courts." Frequently, cities will try to pass ordinances that don't specifically call on panhandling, but rather use phrases like "aggressive behavior," similar to the now rescinded ordinance proposal in Cleveland from earlier this May. 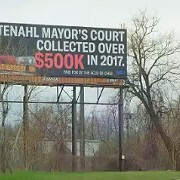 The ACLU of Ohio, the National Law Center on Homelessness & Poverty, together with the National Coalition for the Homeless and more than 100 other organizations, launched the Housing Not Handcuffs Campaign in 2016 to emphasize criminalizing homelessness is the most expensive and least effective way of addressing homelessness. "If somebody is simply asking for help nearby, that is unlikely to pose a real problem for any business," Mead says. "However, if somebody's behavior goes beyond asking for help and becomes more than an annoyance or inconvenience, there are often resources available to help connect that person with assistance. I would check with Northeast Ohio Coalition for the Homeless (NEOCH) and Downtown Cleveland Alliance (DCA) for outreach services that they offer." The letter by the ACLU of Ohio today is part of a coordinated effort among 18 organizations in 12 states targeting more than 240 similar outdated ordinances.